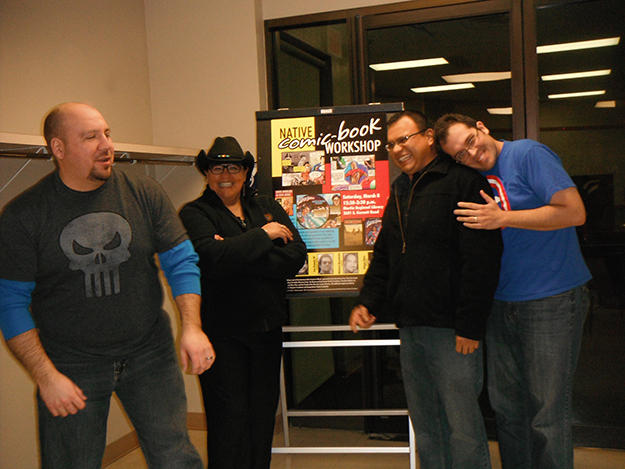 Arigon Starr traveled to Tulsa, Oklahoma for the March 8th Native Comic Book Workshop sponsored by the Tulsa City-County Library’s American Indian Resource Center. Comic creators Michael Sheyahshe, Roy Boney and Lee Francis IV joined Arigon at the Martin Regional Library for the two-plus hour workshop. Lots of folks of all ages and from all different communities attended the talk which covered the history of Native Americans in comics, plus various how-tos for writing, drawing and publishing comic books. “Huge thank you to the American Indian Resource Center’s Teresa Runnels and my friend Mark Abbott for bringing all of us into to Tulsa. I look forward to doing a lot more of this work,” smiled Arigon. The Indigenous Narratives Collective can next be seen at WonderCon at the Anaheim Convention Center April 18-20. More details to come!